Pakistan may be young as a country, but it has already built up a history of political instability, rising Islamic fundamentalism and a knack of using terrorists as its pawns when it needs plausible deniability. The post 9/11 War on Terror put Pakistan under some scrutiny but the country continues to be directed by the very power military and intelligence establishments. The tragic massacre of over 100 school children by the Tehreek-e-Taliban Pakistan (Pakistani Taliban) in December seems to have changed a lot of the attitudes. The country has created military courts to try suspected terrorists and prescribe the death penalty where appropriate. This type of military justice should and has, human rights organizations concerned as the tragic killings are being seen as a license to persecute those whose agendas do not align with the military and intelligence interests. Matthew Green looks at Pakistan’s most recent and previous history with violence, religion and terrorism. Will the Pakistani government and other interests finally crack down on terrorism? 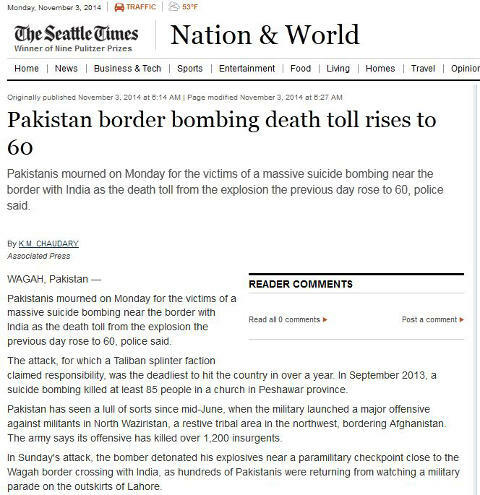 A suicide bombing at the Pakistani border at Wagah has killed 60 and wounded over a hundred. This may well have been just one part of a series of attacks in this area that were subsequently prevented by the security services. This Indian-Pakistani border crossing features a daily guard ceremony which is a carefully choreographed part spectacle, part military tradition and is attended by hundreds of people on both sides of the border with nationalistic fervor. In this attack on Sunday the bomber detonated explosives near the outer portion of the event as people were leaving the area once the border activities had finished. The Taliban splinter group Jamaat-ul-Ahrar, based in the north-western region of Pakistan is reported to have taken responsibility for this terrorist attack. “The Pakistani Taliban splinter group Jamaat-ul-Ahrar claimed responsibility for the attack, saying it was in revenge for the army’s operations in North Waziristan and the killing of their fellow militants there. Ahrar broke off from the Taliban in August, after several commanders had a falling out with the rest of the Taliban leadership. What happens when you have the confluence of terrorism, geopolitics, populism and religious fervor? Usually it is bad news and the Indian sub-continent has been in a constant state of tension as we have two dissimilar paths being taken by the main protagonists. You have one country trying to rapidly industrialize and grow its economy while the other is well on its way to sliding into extremism. 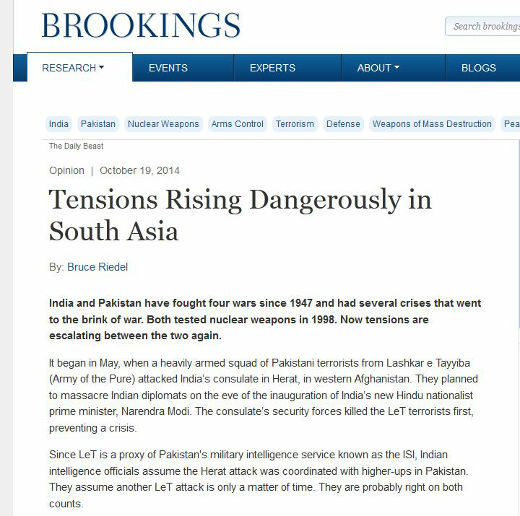 In this article, Bruce Riedel of the Brookings Institution’s Intelligence Project looks at the rise in tensions between India and Pakistan. “This summer, clashes between Indian and Pakistani troops have escalated along the ceasefire line in Kashmir. Called “the Line of Control,” the Kashmiri front line this year has witnessed the worst exchanges of artillery and small arms fire in a decade, displacing hundreds of civilians on both sides. More than 20 have died in the crossfire already this month. Modi has ordered his army commanders to strike back hard at the Line of Control to demonstrate Indian resolve. 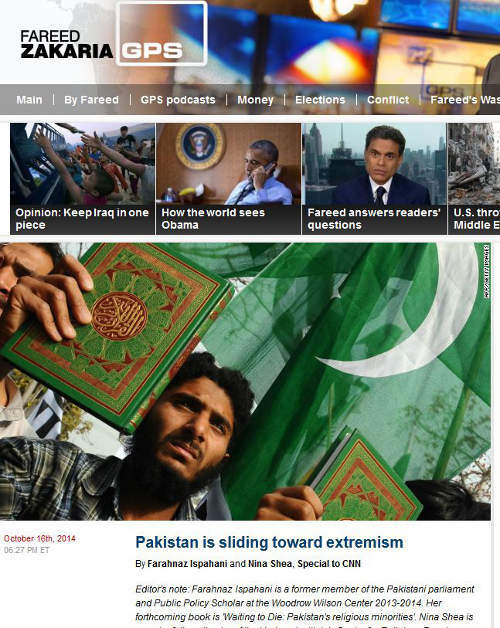 Is Pakistan sliding towards extremism? A plausible retort may well be, “It has been sliding in that direction for years, maybe decades”. Former Pakistani politician and scholar Farahnaz Ispahani and Nina Shea of the Hudson Institute’s Center for Religious Freedom provide a view of the Pakistani state and the interwoven hand of Islamist ideology spreading extremism throughout society. State laws and practices relating to Islamic blasphemy, in particular, are increasingly suppressing moderate voices, while allowing extremists to dominate cultural discourse and learning. As a result, extremism is making ideological inroads into wider and wider segments of the population. 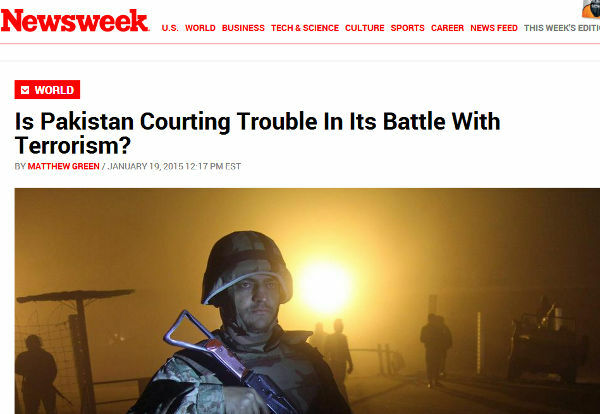 With the “War on Terror” now shifting its focus away from Pakistan’s backyard to the Islamic State in Syria/Iraq and the upsurge of political wranglings in Pakistan, many experts have already predicted that the Pakistani state will go back to the tried and true tactic of revving up its subversive activities against India.